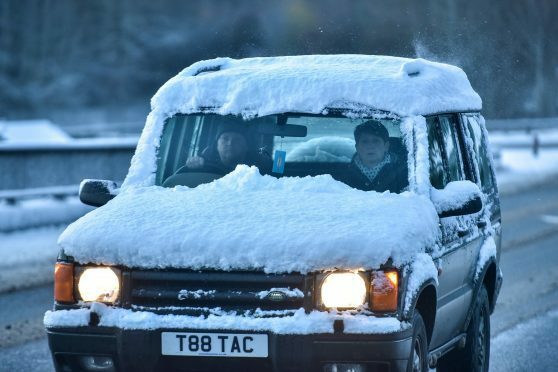 A car covered in snow seen driving in wintery conditions near Craigellachie, Moray in 2015. Ready for Winter encourages motorists to take extra safety measures to ensure their driving goes as smoothly as possible in winter months. Police are encouraging road-users to ensure their tyres have sufficient tread depth, of 1.6mm or more, and to check the fluid levels of engine oil, coolant, anti-freeze and windscreen screen wash. Inspector Neil Morrison said: “Driving in adverse, wintry weather presents additional challenges. “Always switch on your dipped beam headlamps in rain, snow, or misty conditions; don’t just rely on your vehicles ‘day time running LEDs’, as in most cases this feature does not illuminate the rear position lamps. “In adverse weather reduce your speed, increase the distance between you and the vehicle in front and plan for the unexpected. “Don’t be tempted to leave your engine running and vehicle unattended when defrosting it. Insp Morrison also urged cyclists to consider wearing bright clothing and ensure lights are working correctly. Drivers should also pack an emergency bag in their car, with items such as a torch, blanket and extra clothes. Officers will be at Tesco Banchory tomorrow, between 10am-noon, to help anyone wanting to check their tyres, lights, windscreens and wiper blades.